Inherited from President Andrew Jackson was the Van Buren Administration’s faith in “hard money” silver and gold as the only reliable store of value in contrast to shaky credit and worthless paper money. Expressing this hard money outlook, the Mint strove from 1836 to 1840 to create a new circulating silver dollar. 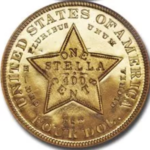 No dollar coin had appeared for circulation since 1804, when the last of the 1803-dated Draped Bust dollars were released. As reworked by Gobrecht and Robert Ball Hughes, Liberty emerged with a rounded head and her dangling right arm appearing immensely long, her left markedly shorter. Pattern obverses of 1836 and 1839 showed no obverse stars but placed the artist’s signature in the field or on the base. Gobrecht’s original reverses of 1836-1839 presented a magnificent flying eagle in a starry or plain sky. Unfortunately, the No Motto Seated Liberty dollar of 1840-1865 deleted the innovative flying eagle, substituting the unimaginative but familiar “sandwich board” bird with dropped wings and a shield on its breast. Liberty had no artist’s signature and sat demurely in a circle of 13 stars with the date placed below. The coins of 1840-65 do not have the motto IN GOD WE TRUST on the reverse. Tiny numbers of proof No Motto Seated Liberty dollars were struck of most early Philadelphia dates, but they are of great rarity. Numbers struck are not known with certainty and are omitted from popular guide books. Proofs were first made for public sale in 1858 when perhaps 80 pieces were struck; later proof mintages never exceeded 1,000 except for 1860, when 1,330 pieces were coined. Proof restrikes were made of the 1851 and 1852 coins. The last No Motto dollar date was 1865, with 46,500 business strikes and 500 proofs made. Two 1866 No Motto Seated dollars are known, but these “fantasy pieces” were made somewhat later for sale to wealthy collectors. In recent years, the existence of a single proof 1851-O specimen has come to light, although researchers postulate that this was accidentally made by the Philadelphia “Midnight Minters,” (probably engraver George Eckfeldt and his son, Mint night watchman Theodore) who in their haste to clandestinely remanufacture the coveted 1851 issue, inadvertently used an 1859 reverse die awaiting shipment to New Orleans. 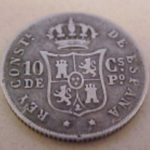 These large silver coins had some odd striking characteristics. The actual position of Liberty’s head may cause poor detail even on pristine specimens. The feathers on the eagle’s leg and the claws may also show evidence of weak strike. Wear first appears on Liberty’s thigh, right breast and the top of her head. The tops of the eagle’s wings follow. Because of their size and weight, uncirculated coins stored in Mint bags will show scattered contact marks. 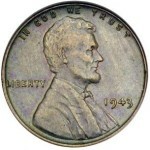 Proofs often are hairlined from the careless handling of early non-numismatic owners or will show evidence of cleaning by old-time collectors. Seated Liberty dollars have gained in popularity with the entire collector community since the 1970’s, when the great U.S. Treasury hoard of silver dollars was liquidated, although few of the design were found. To collectors more familiar with Morgan and Peace dollars issued in the tens of millions, these earlier coins may seem scarce and elusive, and indeed they are. Only a small minority of all Seated Liberty dollars struck remain in existence today. Researcher Weimar W. White estimated that only a fraction surviveeven in low grade. The Seated Liberty series continued from 1866 to 1873 with the reverse motto IN GOD WE TRUST. 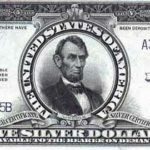 The coinage act of Feb. 12, 1873 discontinued the silver dollar and abolished the legal tender status of all silver dollars struck from 1794 to 1873. This is the law later savagely denounced by the vocal partisans of free and unlimited coinage of silver as the “Crime of `73.” Legal tender status was restored when Morgan dollar striking began in 1878. 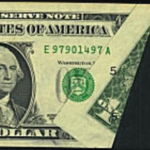 Which Presidents of the U.S. have their portraits on U.S. currency?